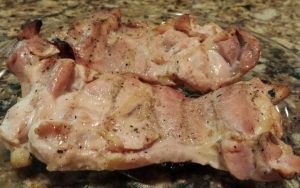 This brine recipe is for 8 boneless skinless chicken thighs or 4 boneless skinless chicken breast. Mix all brine ingredients in a bowl large enough for the brine and the chicken to be submerged. Place chicken in brine and cover with a small plate to make sure the chicken is totally submerged in the brine. Allow to brine in refrigerator for 24 to 48 hours. Grill on medium high heat for 7 minutes (thighs) each side. Grill breast on medium high heat for 10 minutes each side. Allow to rest and enjoy!